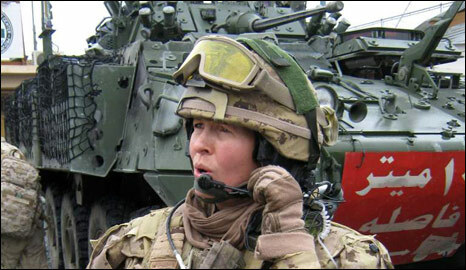 Robyn Bresnahan reports on a mother of four, who made history in 2003 by becoming the first female deputy commanding officer of a combat arms unit in the Canadian military. Lt Col Jennie Carignan is based in Kandahar province in southern Afghanistan - one of the most dangerous parts of the country - and commands a regiment of engineers and landmine experts. Col Carignan says the men under her command treat her like any other soldier - but it wasn't always that way. "I had some tension at the start of my career as a young lieutenant," she told the BBC's World Update programme. The conflicts in Iraq and Afghanistan are the first in which tens of thousands of women have fought alongside men for prolonged periods. This week the BBC World Service is taking an in-depth look at women's stories from the front line. "But a lot of young lieutenants get that sort of resistance when they come in. Basically, you have to earn your stripes." Having 23 years in the military under her belt, with missions in the Golan Heights and in Bosnia-Hercegovina, helps her command respect. "I have grown up with everybody. It's not like I just parachuted in, the brand new girl in town." As for the commanders of the Afghan National Army, she says she has been surprised at how well she has been received. "The uniform helps a lot," she says. "They treat me like they treat any of my male colleagues. In one instance, the Afghan district leader pointed towards me and said they should be doing the same thing." Whether on the battlefront or home front, life can be equally challenging. Col Carignan is a mother of four, with children aged between three and 14. Her family lives in Quebec City in Canada and her husband, Eric, rules the roost. "It's always a challenge for anybody in the military because of the lifestyle that we have," she said. "But my husband is doing extremely well and I trust him 100%." Eric Lefrancois runs a tight ship. And so he should. As a former engineer in the Canadian military, he had an extremely regimented lifestyle for 22 years. Now he is commander-in-chief of a new platoon. As Col Carignan's husband, Mr Lefrancois takes care of 14-year-old Zack, 11-year-old Amelie, nine-year-old Ian and three-year-old Camille. "Amelie does gymnastics three times a week, Zack does violin and he was in the cadets, Ian plays piano and hockey - so I try to keep them busy," he says. "I think it keeps their minds occupied and it's a better way of coping with the situation." Mr Lefrancois retired from the army in 2008, after deciding to train to be a high school teacher. "Jennie never questioned the decision - so I just took the step, which was pretty big because after 22 years in the forces it's pretty tough to let go." He laughs about the reaction he gets when he tells people that he takes care of four kids while his wife is serving in Afghanistan. "Their eyes open pretty wide and they can't believe I'm alone with the kids." If Mr Lefrancois has one concern, it is that Camille will have trouble connecting with her mother upon her return. "I saw it happen with our son Ian when he was two years old," he says. "Jennie had been deployed to the Golan Heights and when she returned, Ian wouldn't go to her - always clinging to me instead." On the other hand, he's proud of how the older children are handling the situation. "Without a mum, for sure you have a big part missing, so they have to contribute to the family life a little more than they would if Jennie was here. "I see them becoming independent, strong people. As parents that was one of our goals." Sitting at the breakfast table with a bowl of cereal, 11-year-old Amelie Lefrancois says she's proud of her mum. "When I tell my friends my mum is in Afghanistan, they say 'aren't you sad, don't you miss her?' and I say 'yes' because I really miss her and I think that she's really brave to be so far away," she says. The family speaks to Col Carignan at least once a week over a webcam. Ian says he loves seeing his mum on the computer because he worries about her. "I feel a little bit sad because there are a lot of people dead and I don't want her to be dead," he says. "It's like there is something in my heart that is missing and I can't wait until she's back home in September." You can listen to the BBC World Service series on Women at War on World Update starting from Monday 15th February.